The 100% Barstow Classic Goggle fuses vintage moto design with modern styling and technology resulting in a timeless look with next level motocross performance. Pros - Great looking goggle, sticky band to grip helmet, nice vents, foam is comfortable and seems to last. Cons - The mirrored lens is garbage. The coating begins to wear off after one clean and visibility is then poor. I spoke with a rep. from 100% and they insisted the coating lasts if you only clean it with the provided cloth and a soap/water mix. They sent me a new pair at a discount. Wiping the lens once with my glove while riding through fog ruined the lens. What if you just grab a paper towel to clean them quickly? You will ruin the lens. What if you need to wipe the lens when riding due to fog, rain, etc.? You will ruin the lens. What if you look at them the wrong way? You will ruin the lens. Also, the frame becomes weak/flimsy after six months. This leads to the lens popping out in the corners and the bottom just above the nose. Now I can't see and wind/debris is getting in my eyes. Summary - Cool looking goggles with attractive designs. Some decent features and materials. However, if you plan to use them for more than a few months or clean your lens, look into a different pair. This are actual motocross goggles with great looks and quality materials. There was this reviewer complaining that the lens is too flimsy and the plastic is too flexible; clearly this guy has never ridden off-road with purpose built goggles as that's how it's supposed to be. Goggles ARE supposed to be flexible so they don't break and shatter and poke your eyes out. Some particular details I loved are the vintage ones, hence the Barstow sub-brand (and pricepoint), including the leather strap ends and metal thingie near the bridge. Some pretty regular details, but with great build quality, are the foam, overall shape and grippy strap. Definitely very retro stylish. Great for riding around town. Does not have the side visibility of bubble shield but still usable. Held up good in highway at 70mph. Best part was dropping it in cement steps, not a scratch. Very happy for its rubber construction. Foam to skin is very comfortable. Sticky strip on inside of band keeps it from moving while on helmet. I love this goggles. The quality is great looks of little details that makes the deference with other goggles on the market. It was introduced as a good product. Does this goggles fit in the Gringo Helmet? Will it work with my Shoei RJ platinum 3/4? 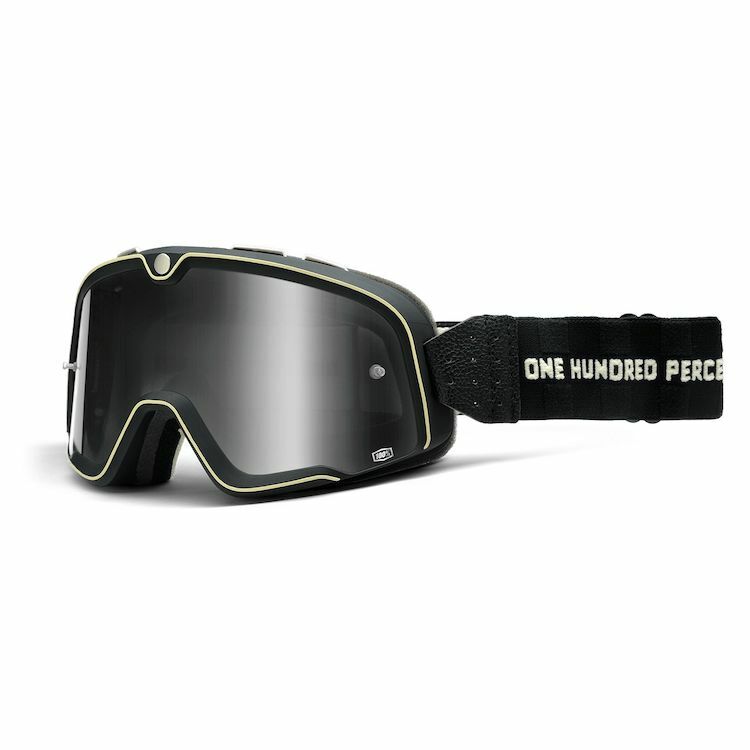 I have a Speed and Strength SS2500, if I removed the face shield and wanted to use these goggles would the opening in the helmet be large enough to accommodate them? My helmet is an XL. i have a Bell custom, size small. I've read that these goggles are a little on the larger size & not as universal as other goggles when it comes to fitting helmets. Can anyone confirm if they'll work for my helmet & size please?